Joseph (or Josef) Stalin (born Iosif Vissarionovich Dzhugashvili ; Russian: Ио́сиф Виссарио́нович Джугашви́ли) (1878 - 1953) was the dictator of the Soviet Union and General Secretary of the Communist Party of the Soviet Union (CPSU) from 1922 until his death from a stroke. Joseph Stalin, who was a brutal proponent of atheistic communism, was greatly influenced by the work of the neo-Lamarckian Trofim Denisovich Lysenko as were other communist leaders. During 1942 - 1943 Stalin reinstated the Russian Orthodox Church in order to boost morale while Russia was at war with Nazi Germany. The son of a poor Georgian cobbler, Stalin was a former seminary student who joined the Communist Party when Georgia was still under the rule of the Russian Tsar. He became one of Lenin's closest allies when the Kerensky regime was overthrown by Lenin's faction in 1917. During the Russian Civil War Stalin, who chose his name from the Russian word for steel, held the city of Tsaritsen on the Volga from counter-revolutionary forces. Stalin later renamed Tsaritsen Stalingrad in honor of his victory; Stalingrad would be the site of Germany's massive defeat in World War II. Stalin was tapped by the Okhrana, the Tsarist secret police, as a low-level informer shortly after he was expelled from the Tiflis seminary in 1899. Stalin then began to systematically inform on revolutionary comrades in party organizations in Tiflis, Baku, and Batum over the next few years. He acquired a highly unsavory reputation among the Social Democrats of these cities and was finally arrested for cover purposes in 1902 when suspicions about him were about to boil over. It was the Okhrana that furnished the invisible means of support for the family he acquired after 1904. Stalin, however, did not allow this to happen. His most powerful rival, Lev Trotsky, who was the commander of the Red Army, was painted as a danger to the Revolution, because he continued to push the idea of international revolution; the "left opposition." Other Soviet leaders, like Zinoviev, leader of the Comintern, and Kaminev, the head of the Communist Party in Moscow, were painted with the same brush because they supported Trotsky and did not wish to expel him from the CPSU in 1927. Later, he accused his ally Bukharin of being a member of the "right opposition," i.e. he was in favor of a more capitalistic economic system, as seen under the New Economic Policy (NEP) of the early 1920s. Trotsky was murdered in Mexico in 1940 by Ramón Mercader in an extensive conspiracy that included underground operatives from the Communist Party of the United States (CPUSA). Zinoviev, Kaminev, and Bukharin were the center of the infamous "show trials" of the 1930s. All were put to death. In 1932, Sergei Ivanovich Gussev, who had served as Comintern agent and Stalin's personal representative in the United States, "commanded the Communists in the United States to take up four tasks. Two of them were the defence of the Soviet Union and the furtherance of Red conquest of China." In 1933 the notorious Gerhart Eisler "was secretly sent into the United States by Moscow to make sure these orders were carried out." Edgar Snow wrote in his 1937 book, Red Star Over China, "The political ideology, tactical line and theoretical leadership of the Chinese Communists have been under the close guidance, if not positive direction, of the Communist International, which during the last decade has become virtually a bureau of the Russian Communist Party. In the final analysis this means that for better or worse, the policies of the Chinese Communists, like the Communists in every other country, have had to fall in line with, and usually subordinate themselves to, the broad strategic requirements of Soviet Russia, under the dictatorship of Stalin." In 1928 Stalin decided that the Soviet Union was not properly industrialized to enjoy a communist future, so he initiated the First Five Year Plan and the campaign to collectivize agriculture in order to "build socialism," and to "catch and overtake" the capitalist world. 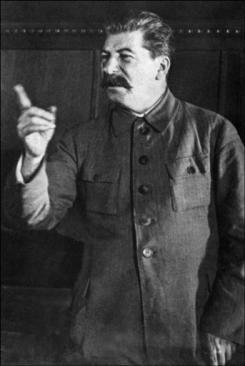 Stalin fanned the fires of collectivization, claiming that peasants had been hoarding grain and that they needed to be controlled. Under this program, rich peasants (kulaks), were exiled or killed for being enemies of the people, and peasants' land was taken in order to introduce collective farming to expedite grain appropriations. Many were called kulaks by jealous neighbors, while the peasants who remained were often the laziest and most ill-suited to producing enough grain. Collectivization caused massive famine in Russia, particularly in Ukraine (see Holodomor), where Stalin ordered the Red Army to blockade certain regions and take grain by force. It is estimated that the famine of 1931-33 killed 6-7 million people, while 20 million starved. The First Five Year Plan was a program of crash-industrialization. After World War I and the Russian Civil War Russia had an industrial capacity equal to that of its 1861 capacity. The only way for Russia to be able to break the "capitalist encirclement," Stalin declared, was to industrialize. Brigades of shock workers were formed to work faster and harder than the world had ever seen. Most of this, however, was pure propaganda, although the shock workers did set the record for concrete poured in a single shift. Compared to the capitalist world which was experiencing the Great Depression, Soviet growth was impressive. Between 1929 and 1937, 8,000 factories were constructed, average GDP growth was around 10%, and the official unemployment statistics, which included gulag detainees, was 0. In 1936, after the Second Five Year Plan, Stalin declared socialism "built." Nevertheless, the capitalist world lived better than the Soviet Union, despite the Great Depression. John Scott, an American CPUSA member and Comintern operative who was living in the Soviet Union during the Five Year Plans, notes this in his memoirs of that period Behind the Urals. The legacy of the Five Year Plans (most of which Stalin declared "completed" in 4 years) injured the Soviet's production models, because the encouraged quantity and speed over quality. However, the planning of the 1930s enabled the Russians to defeat the Nazis in the 1940s. The infamous show trials of former leaders of the Soviet Union occurred during this period, where they were accused of working with Trotsky or sabotaging the Soviet Union. Stalin also eviscerated the high command of the Red Army, killing 90% of the leadership. The minions of oppression were not spared either; of the NKVD's 809 officials, 43 lived through the purges. The leadership of the communist party was persecuted as well. For example, in 1934 130 members of the 139-member Central Committee were arrested. The Terror forever made Russians afraid to speak out against the government, and also made sure that no one but Stalin could ever rule the Soviet Union as effectively. This also ensured that the Red Army could not fight effectively when Nazi Germany invaded the USSR during Operation Barbarossa. "This famine was deliberately engineered by the regime of Joseph Stalin 86 years ago claimed millions of lives, mostly in Ukraine but also in some other parts of the Soviet Union. It is today considered one of the worst atrocities of the Soviet regime and a terrifying act of genocide. Even so, the famine of 1933 is relatively unknown. ... Estimates of how many people died in Stalin's engineered famine of 1933 vary. But they are staggering in their scale -- between seven and 11 million people." To avoid war with Germany, Stalin ordered the Foreign Minister of the Soviet Union, Molotov, to sign a non-aggression pact with Adolf Hitler, named the Molotov-Ribbentrop Pact, on August 19, 1939. The treaty detailed the agreement to split up Poland between Germany and the Soviet Union, give Stalin the Baltic Republics of Latvia, Lithuania, and Estonia, and to allow the Soviets to wage war on Finland, a war that ended in a humiliating Soviet defeat. Part of the reason why Stalin arranged for the signing of the Molotov-Ribbentrop Pact was so he would use Nazi Germany and have them fight a prolonged front against France and Britain so as to weaken Europe enough to have Communism spread quickly through the continent, largely because he realized war would have benefitted Communism's spread better than peace. Both sides, however, knew that they would eventually engage in hostilities. It seems that Stalin anticipated this less than Hitler, who, in June 1941 invaded the Soviet Union with the largest land army ever assembled. It consisted of 170 divisions, or 3.5 million troops. Stalin was caught off guard, and the Nazis blazed a path through the Ukraine and European Russia. Reaching Moscow in October 1941, the Nazis threatened Stalin and the entire Soviet Union with defeat. In only 6 months, the Nazis controlled one third of the Soviet economy, a total of 5% of the Earth's surface. Hitler's troops were defeated at Moscow during the winter of 1941-42 after Stalin appointed Yorky Zhukov as commander of the Red Army. A spy in the German embassy in Tokyo, Richard Sorge, informed Stalin that Japan was not going to attack Siberia, freeing thousands of winter ski-troops to move to Moscow to defeat the Nazis. It was during this time that Stalin famously invoked the name of God and allowed religious services to be conducted after 20 plus years of repression. Also, 1500 factories were evacuated and restored in Siberia and 12-15 million workers were moved east of the Urals, where Soviet production was higher than Germany's in 1942, despite Germany holding some 50% of Soviet industry. After World War II, Stalin's cult of personality emerged as the dominant force of Soviet life. He was credited as the savior of the Soviet Union and the architect of victory, though it was really General Zhukov who was responsible for most of this. The communist youth group, the Komsomol, devoted songs to "the Father of All Nations" or "the Driver of the Locomotive of History." Party membership increased by one million people between 1945 and 1953. Books quoted Stalin as an expert in communism, while he was often photographed surrounded by children to make him seem friendlier. This all served to form a deep, personal connection with Stalin for many Soviets. Indeed, he was loved by the Soviets. Between 1949 and 1952 Stalin increasingly took vacations and met with the Politburo less and less. The atheistic Stalin became increasingly paranoid as he grew older. He eventually suffered from a stroke on March 1, 1953. Ironically, his own megalomaniacal nature beforehand ensured no one dared try to check up on him, as his own guards feared checking up on him lest they be executed due to his leaving explicit orders to not disturb him in his room. Following a stroke on March 1, 1953, Stalin died on March 5 after a period of declining performance. On his deathbed, he also glared at the attendees with disgust and wordlessly pointed at each of them before eventually pointing at a wall, with Svetlina, his daughter, recalling this event, indicating this was the most haunting event she ever experienced. When he died in 1953 an anxious mob at his viewing crushed and trampled some mourners to death. Dissidents like Sakharov, the man forced in a prison to build the Soviet atom bomb, cried upon hearing that Stalin had died, despite their intense hatred of him. Despite his terror, he had convinced millions that he was their father. When he died a short power struggle ensued, one which led to the execution of KGB head Beria as a spy. Eventually Khrushchev became the General Secretary of the CPSU and denounced Stalin's repressive tactics, his purges, gulags, and his cult of personality in the Secret Speech at the 20th Party Congress of 1956. Gulags were dismantled and the political climate was slightly less tense, but Soviet oppression still continued. The period following Stalin's rule is called the "thaw," the start of life again after a long winter. STALIN: "The question of war or peace has entered a critical phase for us. If we conclude a mutual assistance treaty with France and Great Britain, Germany will back off of Poland and seek a modus vivendi with the Western Powers. War would thus be prevented but future events could take a serious turn for the USSR. "If we accept Germany’s proposal to conclude with it a non-aggression pact, Germany will then attack Poland and Europe will be thrown into serious acts of unrest and disorder. Under these circumstances we will have many chances of remaining out of the conflict while being able to hope for our own timely entrance into war. "The experience of the past 20 years shows that in peacetime it is impossible to maintain a Communist movement throughout Europe that would be strong enough so that a Bolshevik party could seize power. A dictatorship by this party becomes possible only as a result of a big war. We are making our choice and it is clear. We must accept the German proposal and politely send the Anglo-French delegations back home. The first advantage we will get will be the destruction of Poland up to the very approaches to Warsaw, including Ukrainian Galicia. "Germany has given us full leeway in the Baltic countries and has no objection to returning Bessarabia to the USSR. Germany is also prepared to yield on giving us a sphere of influence in Rumania, Bulgaria, and Hungary. The question of Yugoslavia still remains open. "At the same time we must anticipate what will ensue from the destruction of Germany in war as well as from a German victory. If it is destroyed, the sovietization of Germany follows inevitably and a Communist government will be established. We must not forget that a sovietized Germany would face great danger if such sovietization occurred after the defeat of Germany in a short war. England and France would be powerful enough to seize Berlin and destroy a Soviet Germany. We would not be able to come to the aid of our Bolshevik comrades in Germany. "Therefore, our task consists in helping Germany wage war for as long as possible with the aim in view that England and France would be in no condition to defeat a sovietized Germany. While hewing to a policy of neutrality and while waiting for its hour to come, the USSR will lend aid to today’s Germany and supply it with raw materials and foodstuff. Of course, it follows that we will not allow such shipments to jeopardize our economy or weaken our armed might." "At the same time we must conduct active Communist propaganda especially as directed at the Anglo-French bloc and primarily in France. We must be prepared for the fact that in France in wartime the Communist Party there must abandon legal activities and go underground. We realize that such work will require an enormous sacrifice in lives. However, we have no doubts about our French comrades. Above all, their task will be to break up and demoralize the French army and police. If this preparatory work is completed in a satisfactory way, the security of Soviet Germany is assured. This will likewise ensure the sovietization of France. "To realize these plans it is necessary that war last as long as possible and that all efforts should be made, whether in Western Europe or the Balkans, to see that this happens. "Let us look now at the second possibility – namely, that Germany becomes the victor. Some propose that this turn of events would present us with a serious danger. There is some truth in this notion. But it would be erroneous to believe that such a danger is as near and as great as they assume. If Germany achieves victory in the war, it will emerge from it in such a depleted state that to start a conflict with the USSR will take at least 10 years. "Germany’s main task would be then to keep watch on the defeated England and France to prevent their restoration. On the other hand, a victorious Germany would have at its disposal a large territory. Over the course of many years, Germany would be preoccupied with the exploitation of these territories and establishing in them the German order. Obviously, Germany would be too preoccupied to move against us. "There is still another factor that enhances our security. In the defeated France, the French Communist Party would be very strong. A Communist revolution would follow inevitably. We would exploit this in order to come to the aid of France and to win it over as an ally. Later these peoples who fell under the “protection” of a victorious Germany likewise would become our allies. We would have a large arena in which to develop the world revolution. Comrades! It is in the interests of the USSR, the Land of the Toilers, that war breaks out between the Reich and the capitalist Anglo-French bloc. Everything must be done so that the war lasts as long as possible in order that both sides become exhausted. Namely for this reason we must agree to the pact proposed by Germany and use it so that once this war is declared, it will last for a maximum amount of time. We must step up our propaganda within the combatant countries so that they are prepared for that time when the war ends." Solzhenitsyn, Aleksandr Isaevich, The Gulag Archipelago, 1918-1956; an experiment in literary investigation, Translated from the Russian by Thomas P. Whitney, Publisher New York, Harper & Row (1974–78), 1st Edition, pg. 67n. This page has been accessed 145,003 times.